Following approval of a crucial issue by the Blaine County commissioners Tuesday, ARCH Community Housing Trust is drawing up plans for a 26-unit rental-housing project near The Meadows trailer park south of Ketchum. The Ketchum-based nonprofit organization hopes to build its price-restricted Quail Creek Townhomes development on about two acres of donated land adjacent to state Highway 75 just north of Cold Springs Drive. It would have eight one-bedroom units, eight two-bedroom units and 10 three-bedroom units. Before it could proceed with its proposed design, however, ARCH needed to find out whether it would be allowed to build 29 feet of a 30-foot-wide access road within the usual 100-foot setback from Highway 75. That permission was granted unanimously by the commissioners Tuesday. It came with a condition that the project’s landscaping comply with the county’s Scenic Highway overlay requirements, which restrict berm sizes and vegetation types and heights. “Now we can proceed with the typical process of entitlements, which begins with the P&Z,” ARCH Executive Director Michelle Griffith said. Griffith said ARCH hopes to have a proposed design for its planned-unit development before the county P&Z next month. The organization’s website states that it expects to begin construction by the end of 2014. The site is in a Medium-Density Residential zone that normally requires lots of at least 0.4 acre. However, the property is also covered by a Community Housing overlay, which allows 13 units to the acre for price-restricted PUDs. The Quail Creek Townhomes site is on part of a 23-acre parcel that was slated to become the site of a 126-unit, part market-rate, part restricted-rate project of the same name proposed by Clear Creek developers in 2004. However, that project stalled due to litigation and the housing downturn, and developer Clear Creek proposed to donate the 2.1 acres to ARCH to fulfill its community-housing obligation. That request will be considered in conjunction with ARCH’s PUD application. Griffith said total cost for the project, including legal and financing fees, is about $6.5 million. It would be funded by about $5 million in low-income tax credits awarded to the state of Idaho by the U.S. Department of Treasury in November, and purchased by private parties, and by about $1 million in HOME loans from the Department of Housing and Urban Development. Griffith said the application process for the funding is very competitive. “It’s very difficult for a high-cost area like Blaine County to compete effectively,” she said. She said the county’s Community Housing overlay and strong demand outlined in local housing-market studies were key factors in the award. Griffith said the HOME loan will be repaid by rental income. She said rents for government-subsidized, price-restricted projects are determined annually by HUD. This year, she said, rents for units such as those planned at Quail Creek range from $529 per month for the lowest-cost one-bedroom units to $1,138 for the highest-cost three-bedroom units. She emphasized that those prices could change by the time Quail Creek is ready for occupancy. People interested in renting one of the units can submit their name to the Blaine County Housing Authority to be included in its database. 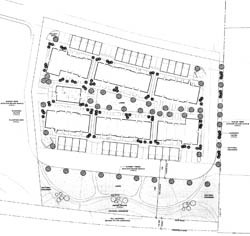 They will then be notified once applications become available for the Quail Creek Townhomes, if it is approved.